We LOVE, LOVE, LOVE comments and interaction from readers. So please do join in the conversation. Ask questions. There’s a contact e-mail address here. Bookmark or save the blog into your reader and come back every week! It will be good times. 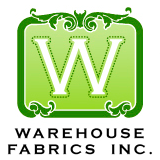 Through this blog, we hope to provide fun, creative ideas using a variety of fabrics from Warehouse Fabrics Inc., which largely focuses on home decor fabrics. We hope you’ll see that home decor fabrics aren’t limited to just draperies and upholstery, though those are fine projects, indeed. You can make lots of different things, from bags to clothing to crafts. You can find fun and easy ways to spruce up your home. Don’t be intimidated! We’re going to do the experimenting for you and show you how. So let’s get sewing! Handmade is huge right now. If you’re a indie patternmaker and would like to have something you designed featured, please contact us about it. If you’re willing to send us a pattern, and we have the right fabrics for it, we’d love to make this blog a place to support small, independent businesses.